On 28 August, during a tour in the region, the Deputy Prime Minister and Finance Minister Simeon Djankov visited the Palaeontological branch of the National Museum of Natural History in Asenovgrad. According to the curator of the museum Dimitar Kovachev, he was very impressed by what he saw. 'Came around noon, just after I received a call from the Tourist Centre that an important guest arrives. Didn't expected a minister. When I saw Mr Djankov I couldn't believed! To come up a minister — it never happened', excitingly told Kovachev. 'Only by speaking, I knew it', explained the curator. 'Fast, but patiently examined the entire museum. Remained very impressed', Kovachev said. 'At the entrance stopped at the head of a mastodon with well preserved molars, which causes respect to all the guests — not on display elsewhere. It was found near the town of Radnevo', Kovachev told. The curator informed the minister about the history of the fossil apes, hipparions, saber-toothed tiger. Djankov literally gasped when he entered the hall with the 4.5 metres high and 7 metres long Deinotherium skeleton, who lived in our lands 6 million years ago. The terrestrial mammal was discovered in 1965 near the village of Ezerovo. 'His most important feature is the downward curving tusks attached to the lower jaw. There never was such an animal. It weighted 12 tons', he told the minister. Djankov pulled out a cell phone and asked to be photographed in front of the impressive mammal. Before leaving the Deputy Prime Minister Djankov asked what could help the museum. 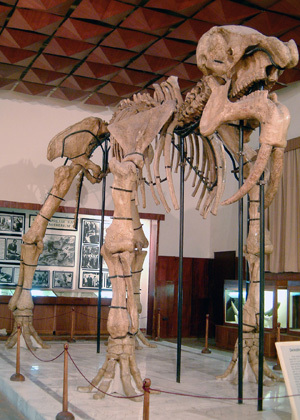 Kovachev told him that the museum needs 25—30 thousand leva for the completion of another hall, which will exhibit bones of mastodons and other large fossil mammals from the Dorkovo locality near Velingrad. This is a good reason to support the museum in a difficult financial situation in which it is now.